2018 program bookWomen Can Do is a one-day career immersion experience for 9-12th grade girls from across Vermont. 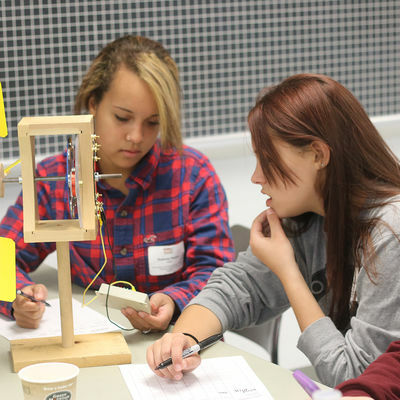 It features dozens of hands-on workshops and action stations highlighting careers in the skilled trades and STEM (science, technology, engineering, and math) fields. Hands-on workshops are led mostly by women professionals in the skilled trades or science, technology, engineering and math (STEM) fields. At Women Can Do, girls may operate an excavator, weld, climb a fire ladder, build a robot, design a 3D model, create an online game, wield a chainsaw, extract DNA from cells, or change a tire. 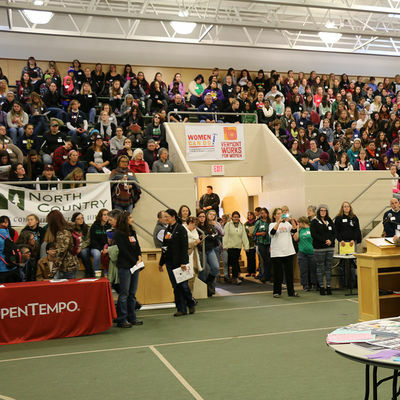 More than 35 workshops highlight careers in architecture and engineering, computer programming, green energy, natural resources, public safety and health, communications, trades, and other non-traditional careers for women. An amazing, well-run and valuable opportunity for young women to "see" what their choices can be for the future and to understand how they can create their own vision for their future. Excellent! I am powerful and independent and I will be successful!